With an increasingly 'mobile' population, pupil numbers and age ranges can fluctuate from year to year and even within terms. We presently have 8 classes from 3 to 11 years of age and, in common with other schools, this means having mixed ability groups and often placing more than one age group in each class. Class teachers use their professional judgement to ascertain the most effective methods of teaching, depending on the needs of the pupils, the subject matter and resources. At Oaklands Primary School all classes provide differentiated work to cater for the needs and abilities of all children, most able and talented children being encouraged to extend their skills and knowledge and the less able children being given work to enable them to fulfil their potential. Oaklands Primary School also hosts a LA funded Special Needs Unit. This caters for pupils aged from 3 to 7 years old with Communication disorders. Mrs Cook manages this class. Pupils will be involved in an act of collective worship each day in our assemblies, which are sometimes led by various clergy or other visitors. Parents wishing to withdraw their children from assemblies should write to the Headteacher. A number of extra-curricular activities are available to the children. These vary from term to term and are often based upon what is most suitable at a particular time of year. The school council is a committee of pupils who have been elected by their peers. It gives the pupils at Oaklands Primary a ‘voice’ and platform to make changes to our school. Some of the items that have been discussed by the school council are Bullying, Healthy Eating and improving Play equipment on the Yard. 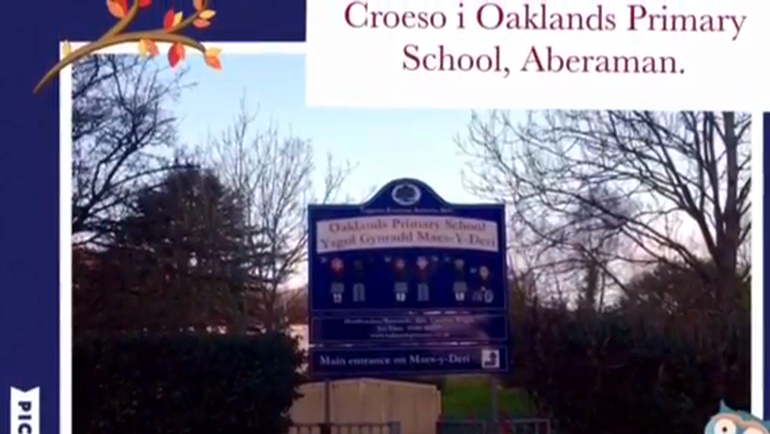 Oaklands Primary School is part of the Welsh Network of Healthy Schools. We aim to promote attitudes towards a healthy lifestyle amongst the children. Parents who choose Oaklands School for their children agree to support the policy of wearing a school uniform. There are many reasons to promote a uniform, the main ones being to ensure no child is made to feel inadequate by being unable to wear the latest fashion, cost effectiveness and a sense of belonging. Children will be required to wear T-shirts and shorts, with trainers for outdoor PE. They will participate in Indoor PE lessons barefooted. Football boots may be worn for football or rugby lessons. Children are expected to have a change of clothes for PE for reasons of hygiene. Please label all items of clothing with your child's name as an aid to identification. We discourage the wearing of jewellery in school on health and safety grounds, but stud type earrings may be permitted on parental request. These should not be worn for PE or swimming. School Meals are provided by Catering Direct and are cooked on the premises by Mrs Maureen Owen. Children may bring in a packed lunch to eat in the dining hall if they prefer. We ask that dinner money for the week is paid for in advance, on Tuesday mornings and that it is sent into school in an envelope clearly marked with the child's name. All cheques for dinner monies should be made payable to ‘Rhondda Cynon Taf County Borough Council.’Parents may also wish to pay dinner money on line. Some children may be eligible for free school meals, details of eligibility and relevant forms are available from the Office Manager, Mrs Archer. At Oaklands we run a free breakfast club as part of the Welsh Assembly Government Initiative. Children can attend between 8.00am – 8.30am. The children will be supervised until the school day starts. All children are invited to attend. Forms are available from the Office Manager, Mrs Archer.